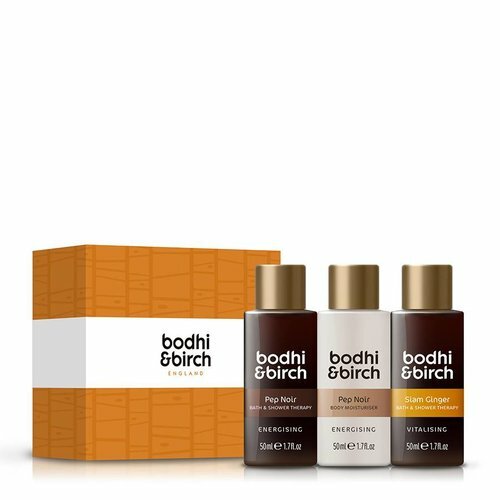 Deze ecoluxe kadoset in fraaie kadoverpakking van Bodhi & Birch bevat natuurlijke, op aromatherapie gebasseerde producten voor een heerlijke home spa beleving. Allure Gift set is een driedelige kadoset met 50ml travel verpakkingen van Bodhi's sensuele bestsellergeur Ylang-Ylang Incensa en de geur Camomile Sky. Een heerlijk aromatisch kado om te geven en te krijgen. Gebruiksaanwijzing: zowel voor bad als douche te gebruiken. Laat het lekker schuimen onder een straal water of gebruik een douche puff. Breng de bodylotion aan op de nog vochtige huid. Ylang Ylang Bad & Shower Gel: Aqua (Purified Water), Disodium Cocoamphodiacetate (from Coconut Oil), Disodium Laureth Sulfosuccinate (from Coconut Oil), Coco-Glucoside (from Coconut Oil & Fruit Sugar), Polysorbate 20 (from Coconut Oil & Fruit Sugar), Cananga Odorata (Ylang-Ylang) Flower Oil, Cedrus Atlantica (Atlas Cedar) Wood Oil, Anthemis Nobilis (Camomile) Flower Oil, Hyacinthus Orientalis (Hyacinth) Flower Extract, Lonicera Caprifolium (Honeysuckle) Flower Extract, Schinus Molle (Pink Peppercorn) Seed Oil, Pogostemon Cablin (Patchouli) Leaf Oil, Citrus Aurantium Amara (Neroli) Flower Oil, Lactic Acid (from Beet Sugar), Gluconolactone (from Corn), Sodium Benzoate, Benzyl Salicylate*, Geraniol*, Benzyl Benzoate*, Farnesol*, Limonene*, Linalool*, Lilial* * natural component of essential oils. Ylang Ylang Body Moisturiser: Aqua (Purified Water), Glycerin, Cetearyl Alcohol, Oleyl Erucate, Cocos Nucifera (Coconut) Oil**, Aleurites Moluccana (Kukui) Seed Oil**, Sorbitan Stearate, Sorbityl Laurate, Sucrose Cocoate, Butyrospermum Parkii (Shea) Nut Butter**, Zea Mays (Corn Starch)**, Polysorbate-80, Lauryl Glucoside, Cananga Odorata (Ylang-Ylang) Flower Oil, Pogostemon Cablin (Patchouli) Oil, Lonicera Caprifolium (Honeysuckle) Flower Extract, Schinus Molle (Pink Peppercorn) Oil, Citrus Aurantium Amara (Neroli) Oil, Hyacinthus Orientalis (Hyacinth) Flower Extract, Anthemis Nobilis (Camomile) Flower Oil, Phenoxyethanol, Ethylhexylglycerin, Citric Acid, Tetrasodium Glutamate Diacetate, Benzyl Alcohol*, Benzyl Benzoate*, Benzyl Salicylate*, Lilial*, Eugenol*, Farnesol*, Geraniol*, Limonene*, Linalool* * natural component of essential oils. Chamomile Sky: Aqua (Purified Water), Disodium Cocoamphodiacetate (from Coconut Oil), Disodium Laureth Sulfosuccinate (from Coconut Oil), Coco-Glucoside (from Coconut Oil & Fruit Sugar), Polysorbate 20 (from Coconut Oil & Fruit Sugar), Anthemis Nobilis (Camomile) Flower Oil, Pelargonium Graveolens (Geranium) Flower Oil, Cymbopogon Martinii (Palmarosa) Oil, Myroxylon Pereirae (Peru Balsam) Oil, Citrus Aurantium Bergamia (Bergamot) Fruit Oil, Dalbergia Sissoo (Indian Rosewood) Oil, Hyacinthus Orientalis (Hyacinth) Flower Extract, Valeriana Officinalis (Valerian) Root Oil, Citrus Aurantium Amara (Neroli) Flower Oil, Lactic Acid (from Beet Sugar), Gluconolactone (from Corn), Sodium Benzoate, Geraniol*, Benzyl Benzoate*, Benzyl Cinnamate*, Citronellol*, Limonene*, Linalool* * natural component of essential oils.